Opening: 5 September 2013, 6 — 9 p.m.
Mo — Fr, 10 a.m. — 6 p.m.
With the subsidy award of the PREVIEW BERLIN and Berlin Hyp, awarded for the first time in 2012, two artists are ensured a solo exhibition in Berlin each year. As the winner of the award, Sara Möbius (born in 1985 in Halle) will show her works from September in the Berlin Hyp exhibition rooms. The opening will be held there on 5 September from 6 — 9 p.m. in the presence of the artist. Sara Möbius studied in the graphic art class of Prof. Thomas Rug at the Burg Giebichenstein University of Art and Design Halle from 2006 to 2012. She has worked as a freelance artist since 2012. 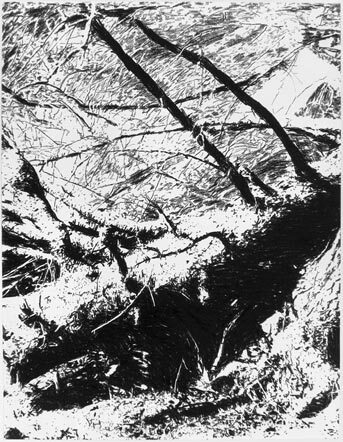 Her large-scale charcoal drawing “Deep Forest”, which premiered at the PREVIEW BERLIN ART FAIR 2012, expanded the art fair booth of the Burg Giebichenstein University of Art and Design Halle into a deep and romantic forest landscape. Sara Möbius’s graphic works in black and white are characterised by an extraordinary visual power, a characteristic style and a reduction to the essential. Natural phenomena are a recurring underlying theme in the work. The focus of her work is the impetus to open associative spaces, stimulating the creative process in the viewer’s consciousness. An intimate atmosphere is created, affected by the pull of silent longing. Along with Sara Mobius, André Pirrwitz took home the award in 2012. He was presented by the Istanbul-based gallery Riff Art Projects at the PREVIEW BERLIN ART FAIR. The exhibition of his large-format photographic works can still be viewed until 2 August 2013.